Sorry, I mangled my rpp,faco;otoes.of! Photo courtesy of Dave Chadwick. 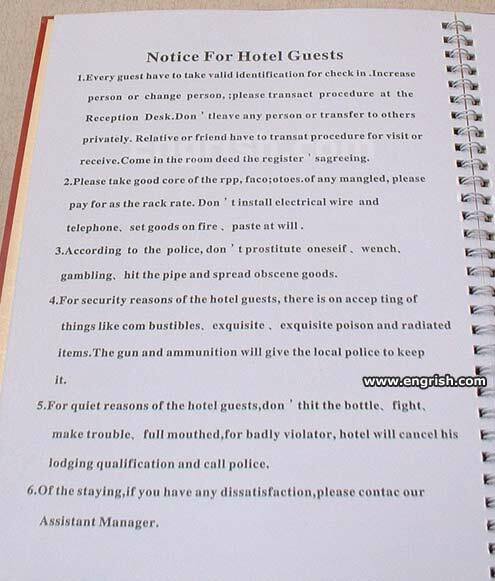 Found in China hotel room. May I have a hotel room if I change person? I didn’t bring my exquisite, but I’ll turn over my exquisite poison. I understand: rules like these exist because foreigners’ll try to get away with anything once. I am 45, what is this? All you can do there is sleep! Oh god. I really hope no-one brought exquisite poison with them! Okay. I’ll set my goods at fire. That wench is always prostituting herself and hitting that pipe with that full mouth of hers. She just thinks she can paste at will.